By the grace of Lord Sri Gauranga the book was published. 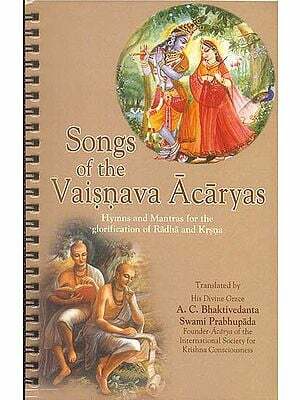 It includes translation of some selected poems of a Vaishnava poet of modern age Srimat Kishore Rai Goswami. The purpose is to extend the scope of reading to a greater sphere of readers who do not know Bengalee. The poems have come out spontaneously from the devotional heart of the poet. So it is beyond all doubts that those are full of devotional fervour. The poet has written a large number of poems of different nature and tastes. The picture of his spiritual life has been reflected in the poems. So while reading the poems stress is to be given on the degree of intensity of devotional sentiment, though the poetic thrill of the poems would touch and shake the heart of the reader. Srimat Kishore Rai Goswami now is the chief of the Ashram. His life is a living manifestation of simplicity, humility, love and compassion. Though it is very difficult to translate such poems carrying intense spiritual sentiment, I have taken the risk. I am extremely unworthy for this work. So the reader must find different types of limitations in it. I beg pardon for all my drawbacks. It is noteworthy that in translating such poems major difficulty arises in case of terminology. Proper philosophical and spiritual terms carrying equal sense of original Bengali are not available in English vocabulary. To avoid this difficulty I have followed the method of transliterating the original Bengali terms in many cases. Explanations where necessary are indicated in footnotes. In fine, I cordially pray to all please read the poems and fill your heart with divine joy. by Ed. by: Steven J. Rosen; Foreword by: Edward C. Dicmock, Jr.
Vrindaban Research Institute & D. K. Printworld (P) Ltd.